Dixie, a miniature poodle, was surrendered to an open-admission city animal shelter in early 2014. She was old, blind, underweight and most of her teeth were missing. Her chances of being adopted were slim, so Shelter Animals Rescue Group (SARG) took her in and placed her in a loving foster home, where her road to health began. Dixie is having a good hair day. The road, however, wasn’t smooth. She was sitting in her fosterer’s lap at a large adoption event, when another dog at the event grabbed her from behind. She was rushed to the hospital with puncture wounds and lacerations. “Her road to recovery began anew,” says Claire Sinclair, who saw Dixie’s listing on Petfinder. 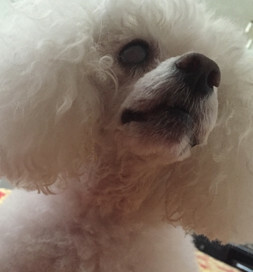 Her 18-year-old dog, Coco, had died in September. “It was very hard not having him around, despite having two other pups,” she says. “I felt a hole in my heart.” She feels something led her to Dixie, and she adopted the 13-year-old blind dog in November. 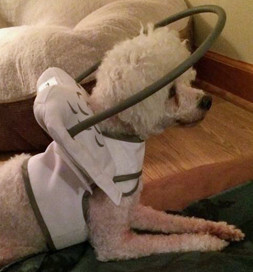 At first, Dixie’s halo helped her navigate her new home safely. Dixie’s exuberance and joy proves that, given a second chance, you can’t hold a good girl down.